I am always cracking my head every morning on what breakfast to serve my Princess and Prince so that they will eat up their breakfast fast enough. I have given food like bread with jam/Nutella, milk with KoKo Crunch as well as cake but seems like they always talk their own sweet time, chatting and eating away. I remembered grandma says she like the texture of the Danish Bread loaf so instead of rolling the dough with butter, I used the bread dough recipe as my bread base. I added 1tsp of Thyme and Basil each, 2tbsp of shredded cheddar. 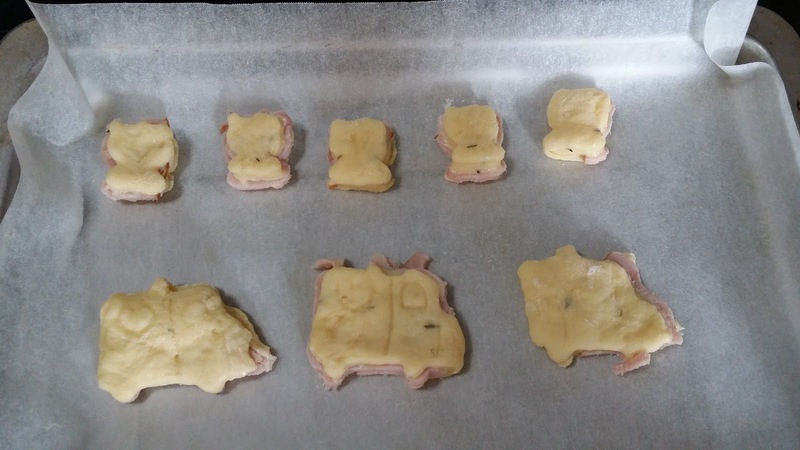 After 1st proof, roll 100g of dough out, wrap with ham and cut out shapes with cookie cutter. Set aside to proof. As for the balance dough, I shaped into loaf and braided the balance dough tt I used for the cut-out bread. Haha. Even my children are quite grown up now, I am still cracking my head over breakfast,lunch and dinner. Great to serve your bread for breakfast! Yes... Always thinking wat BF will entice my 2 sleepy heads to eat n enjoy BF.. I have the same headache about breakfast and what to bring to school!